From 100 Years of Emigrant Ships from Norway: The S/S Hekla was built in 1881 by Kockums Mekaniska Värkstads at Malmø for the Thingvalla Line. She was named after the well known mount Hekla at Island. The mountain has had an active volcano for centuries. The Hekla had a tonnage of 2788 gross tons, and her dimensions were 95,40 meters of lenght and 11,95 meters beam. She had straight stem, one funnel, three masts, and was an iron construction. There was a single screw and she had a service speed of 11 knots. There was passenger accommodation for 12 first class- 16 second class and 600 third class (steerage) passengers. 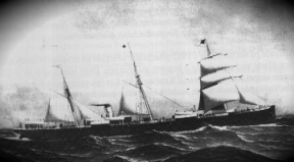 in 1882 she left Copenhagen on March 25th on her maiden voyage to Christiania (Oslo), Christiansand and New York. She called at Christiania on Sunday 26th March. On the 13th of February 1883 she departed Copenhagen and on the 14th she departed Christiania for the seventh and last time heading for Christiansand and new York. On the 15th she stranded at Sydostgrunnen off Sandefjord in Vestfold. After being afloat for about 2 days she sank on the 17th, and much of her cargo, and all passenger and crew were rescued. Denne siden ble sist endret 29. mai 2015 kl. 15:59.